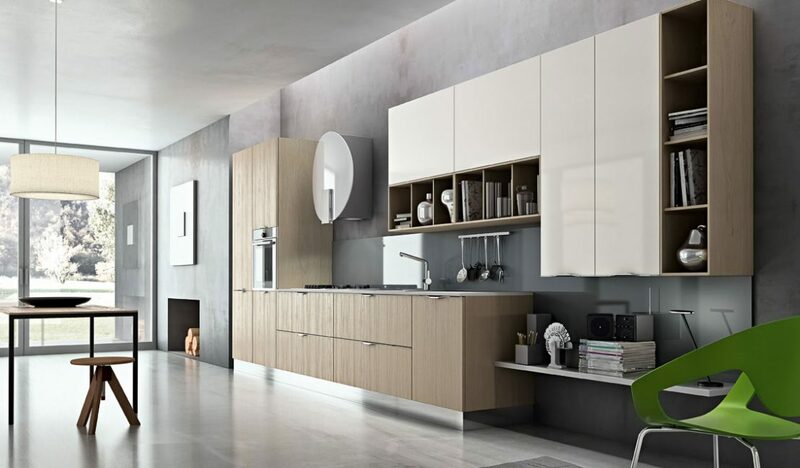 Modern Kitchen Aleve: The lively, modern feel of a well-balanced, youthful appearance combines with the practicality and convenience of a kitchen that’s perfect for everyday tasks. 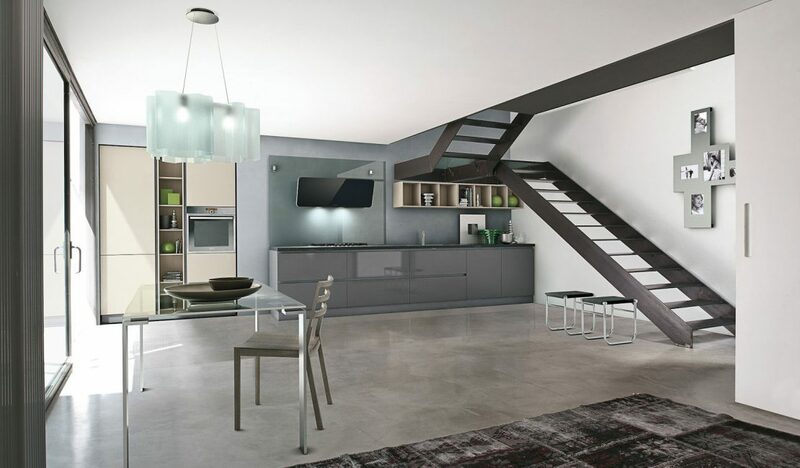 Alevè meets the needs of rationality and ergonomics, throwing in an urban touch of glamour as well. 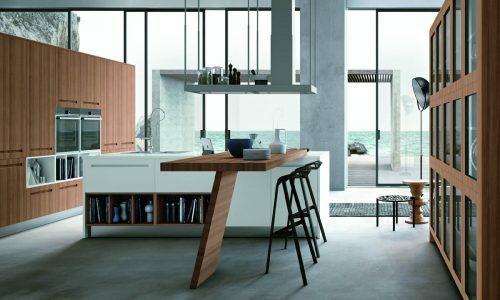 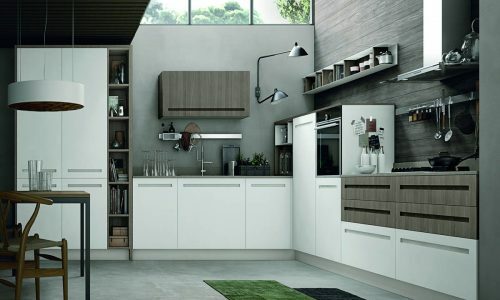 Dynamic, fresh compositions with a wide choice of elements with open modules allowing the kitchen area to flow into the living zone. 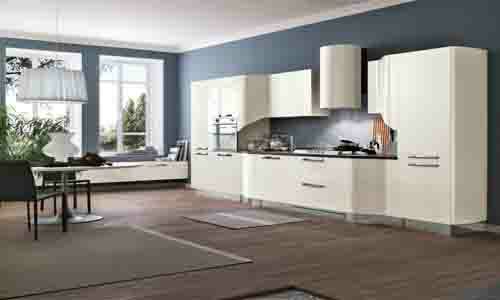 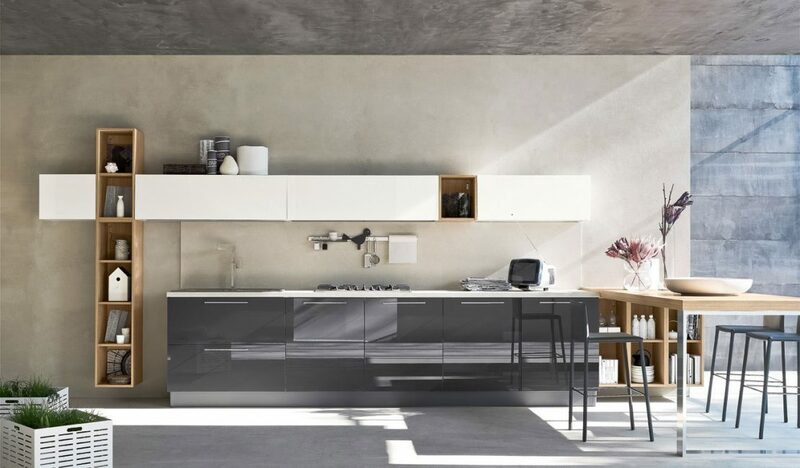 Ardesia gloss lacquered Alevè Lux base units, two-tone edge with Bridge handle. 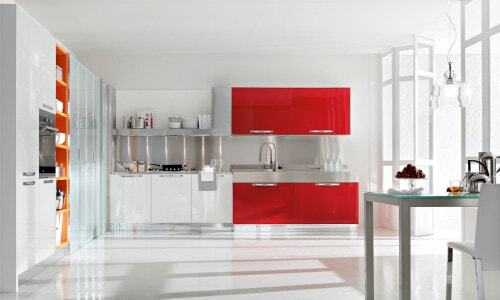 UV Neve gloss lacquered Alevè Lux wall units with two-tone edge. 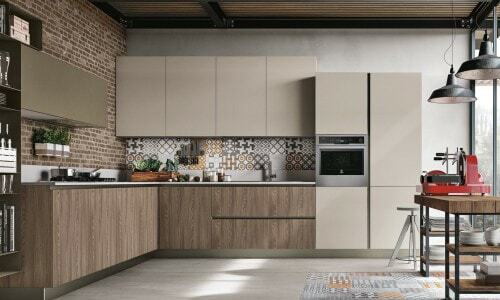 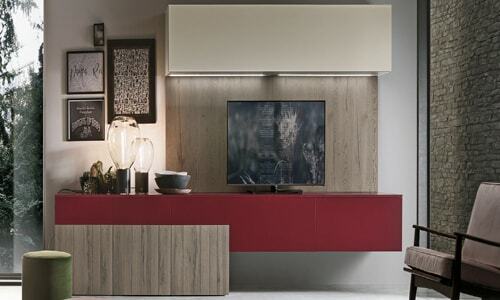 Alevè Dekor open wall units in Olmo Mercurio laminate with edge in matching colour. 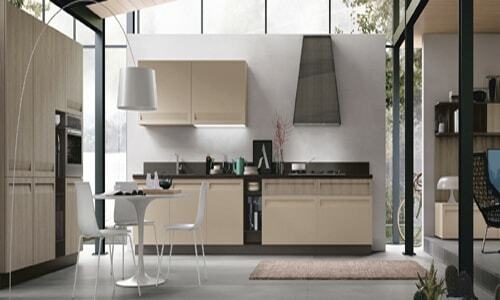 Top and back panel in Beige Eclettica Kerlite. 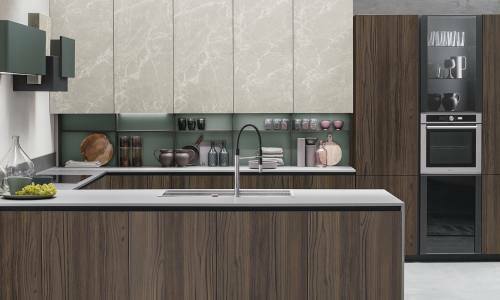 Breakfast bar top with Olmo Mercurio finish. 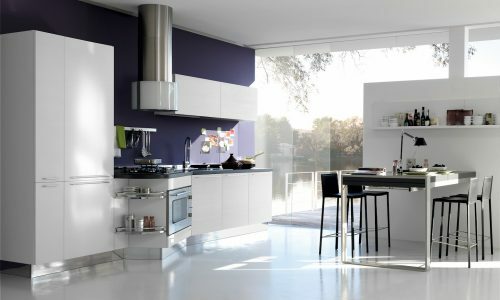 UV Neve gloss lacquered Alevè Lux tall units with two-tone edge and Alevè Dekor open end panel, Olmo Mercurio laminate with edge in matching colour. 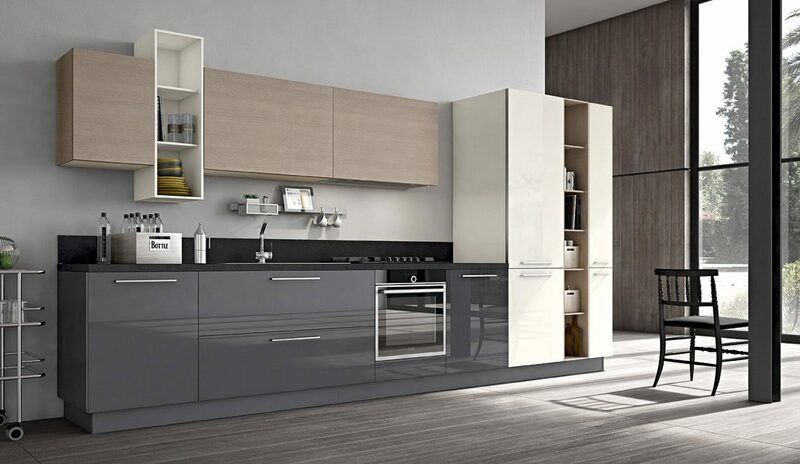 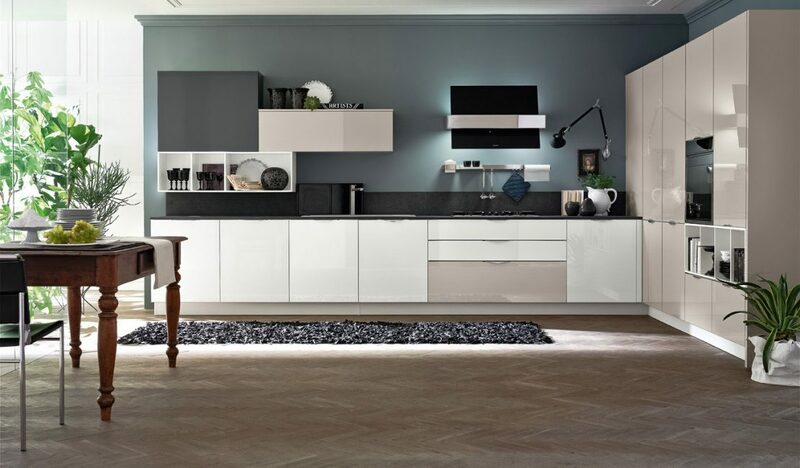 Alevè Dekor base and wall units in Olmo Crystal laminate with edge in matching colour with Vitra handle. 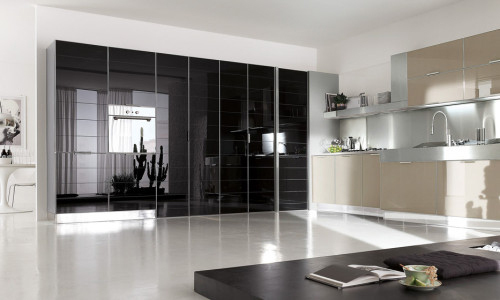 Eclettica wall units in Bianco matte glass. 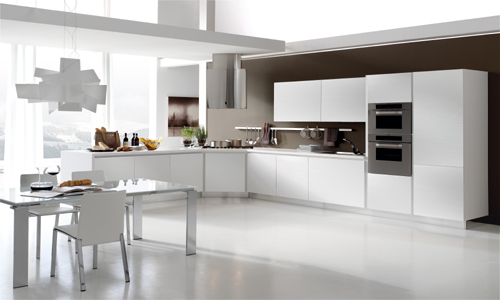 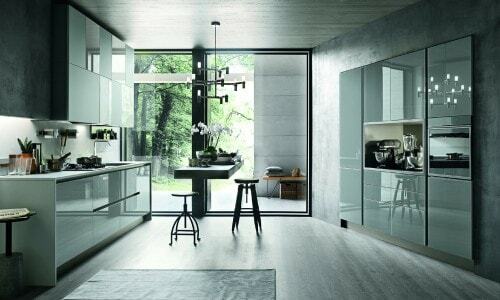 Bianco matte lacquered open wall units. 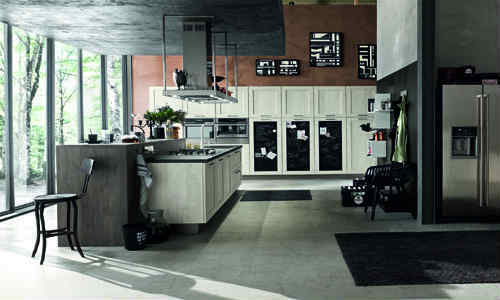 Top and back panel in Bianco matte laminate. 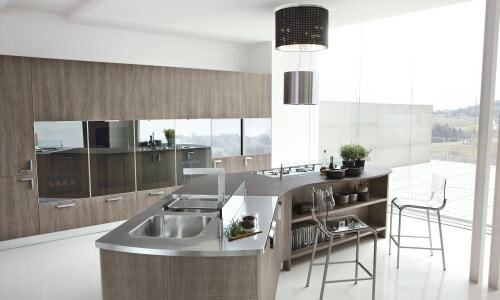 Breakfast bar top with Olmo Crystal finish. 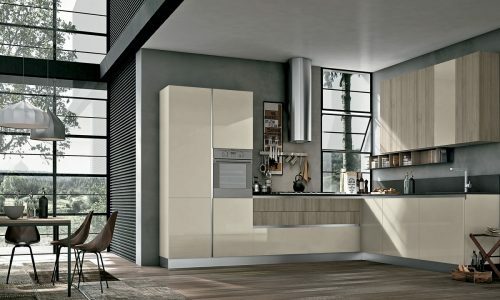 Alevè Dekor tall units in Olmo Crystal laminate with edge in matching colour and Bianco matte lacquered open compartments. 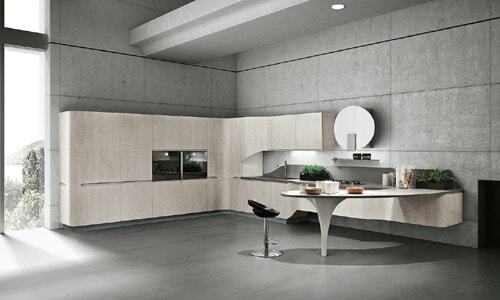 The change to GRASS permit to the entire range of STOSA pullout elements to be offered in a single configuration of covered sides which, as well as meeting aesthetic requirements, with elegant finishes in steel, give the basic product a high quality standard, all with extreme consistency in he whole line of standard and reduced products, based on the extreme smoothness, rigidity and stability of the runners. 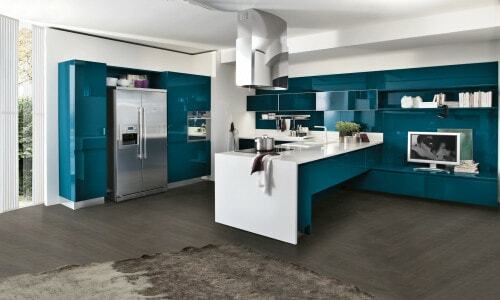 Wood and lacquer for a natural and pleasant to see and touch effect. 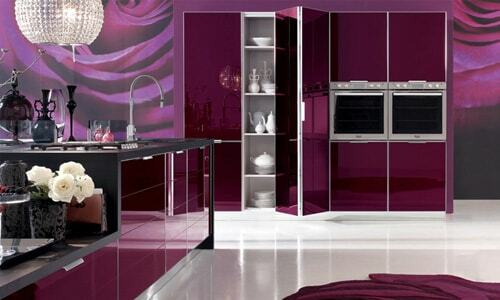 Ardesia gloss lacquered Alevè Lux base units, two-tone edge with Bridge handle. 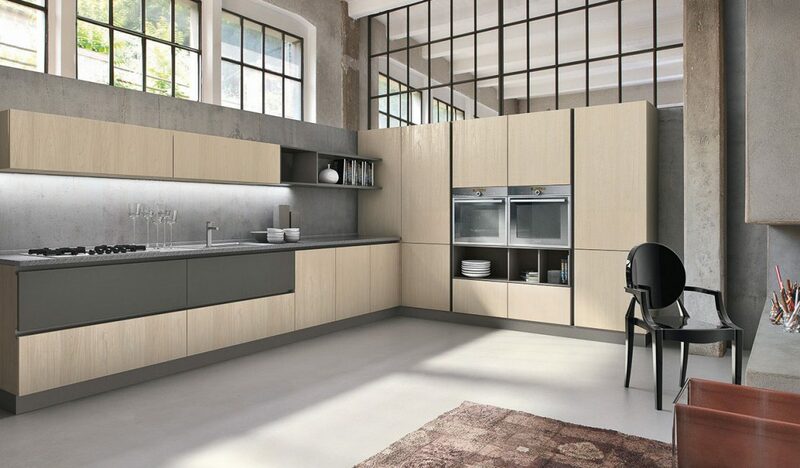 Alevè Dekor wall units in Argilla laminate and edge in matching colour. 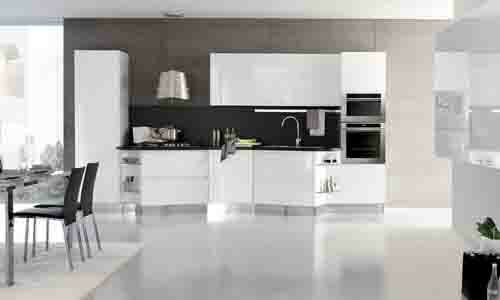 Bianco matte lacquered open wall units. 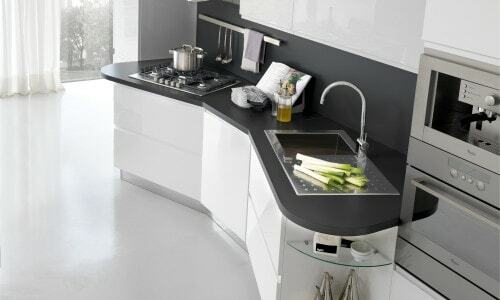 Top and back panel in spacco nero quartz. 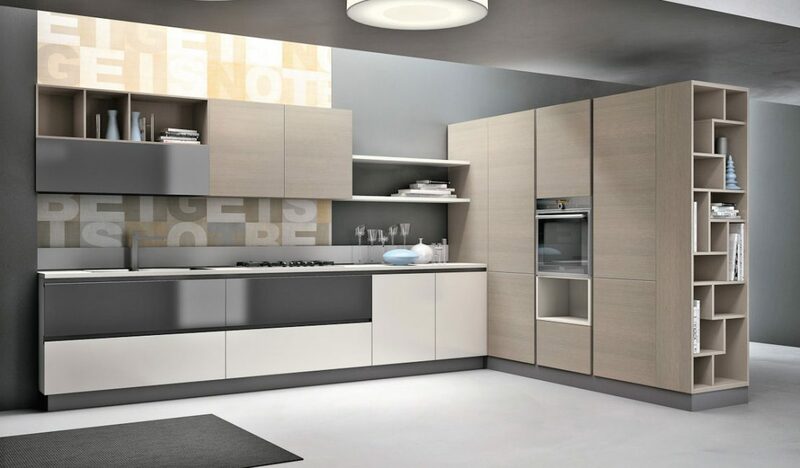 UV Neve gloss lacquered Alevè Lux tall units, two-tone edge with Bridge handle, Alevè Dekor open compartment in Argilla laminate with edge in matching colour.